Every year ICSI conducts CS Foundation, Executive and Professional exams twice in a year in the months of June and December. Many students want to know CS Pass percentage for Foundation, Executive, and Professional Examination & can check CS Result for all levels at the official site. Here we have uploaded the CS Foundation, Executive and Professional Pass percentage details in below tabular forms. Company Secretary is the senior post in a private or public sector’s company that deals with legal activities of any business. The role of company secretary is to keep the records, tax returns, advice and evaluate legal aspects of organization. It is also a traditionally positioned cadre in which it has support of board of directors and administrative staff. The company secretary takes care of corporate governance & legal matters of the organization and is responsible for the administration of the organization ensuring statutory & regulatory compliance. He also ensures the implementation of decisions of the board of directors of the company. The main role of the company secretary is to communicate and register shareholders of the companies and to ensure the dividend that are paid and to maintain annual records. Company Secretary is a three years course conducted by Institute of Company Secretaries of India (ICSE) under three levels viz. Foundation, Executive and Professional. Every year ICSI conducts exams for CS Foundation, Executive & Professional levels twice in a year in the months of June & December. After declaring results, the students first start searching for pass percentage of the exams. 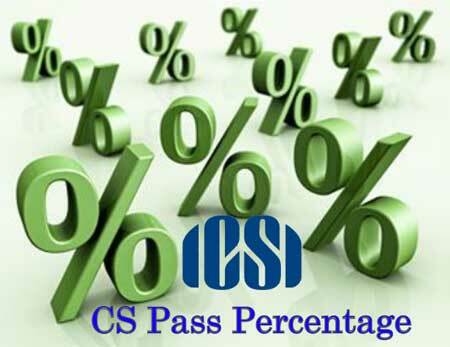 Here we provide the analysis of CS pass percentage of CS exams and the students can check the pass percentage from the following information. Note: Information regarding 2016 CS exam pass percentages is not available.